​The U&I District Convention is approaching fast! 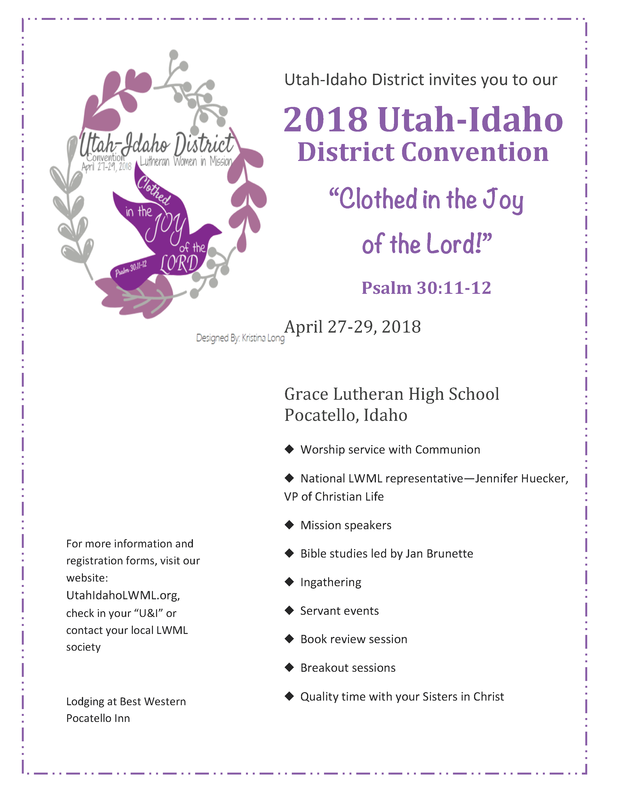 It will be April 27-29, 2018, at Grace Lutheran Church and High School, Pocatello, Idaho. The verse is Psalm 30:11-12 ESV with a theme of “Clothed in the Joy of the LORD.” Come join us for great Bible study, fellowship, mission speakers, a national LWML representative, book review, and undoubtedly, chocolate. We will elect new officers and vote on our mission grants for the next two years. We will be staying at the newly renovated Best Western Hotel just down the hill from the church and school. Get it on your calendars now—it will be a great time. Watch for more information and registration forms after Christmas. Do you have a Young Woman in you congregation who you would like to attend hte convention as a Young Woman Representative? can manage a weekend away from home early on may yield a better response. The society is responsible for the expenses of their YWR so please keep that in your budget!